Recently, the Chinese Smartphone maker, Xiaomi, made a grand entry into the Smartphone world with its candy bar phone – Mi 3. The company is known for its tactics of selling batches of new devices on online stores (such as Weibo, flipkart, etc.). It’s selling handheld devices in Mainland China, Hong Kong, Taiwan, Singapore and is planning to enter ten more countries by the end of this year. According to reports, the Chinese company, Xiaomi, is outpacing Apple on sales in the gigantic, hypercompetitive market. Xiaomi packs a bigger 13 megapixel sensor in the Mi 3, which is better than the 8 megapixels found on the Nexus 5 or the iPhone 5S. The Mi 3 has an improved camera interface that amazingly supports new shooting modes and adds HRD in videos. This smartphone captures amazing photos in low light with its super-large Exmor sensor and an f/2.2 aperture. The built-in dual-LED flash quickly adds the perfect lighting to make your subject appealing. 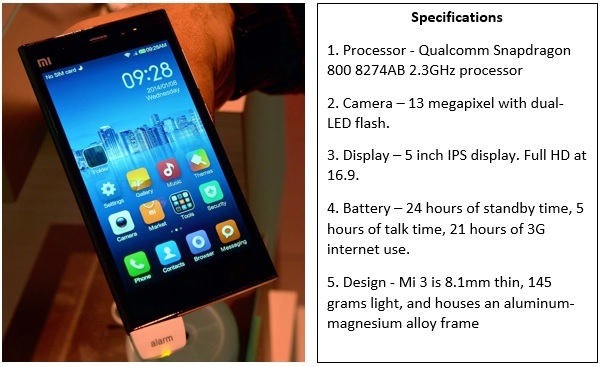 The Xiaomi Mi3’s Qualcomm Snapdragon 800 8274AB 2.3GHz processor has amazing computing power and it delivers a great effect on tasks such as photo sharing, video loading, surfing the internet, and more. Experience your favorite games and videos at blazing speed with Mi3 Smartphone. The display is the mirror of every Smartphone that keeps it in the front row. Without a notworthy display, we can’t talk about any other design features. Its full-screen, anti-glare coating gives you high screen readability wherever you go. The Mi3 is 8.1mm thin and houses an aluminium-magnesium alloy frame coated with three layers of thermal graphite.